Quantum networks require the crucial ability to entangle quantum nodes. A prominent example is the quantum repeater, the central theme of the QuReP project, which allows overcoming the distance barrier of direct transmission of single photons, provided remote quantum memories can be entangled in a heralded fashion. Building on our recent progress with quantum memories based on rare-earth-ions-doped crystals, The Geneva group have recently demonstrated heralded entanglement between two quantum nodes. The entanglement is created by storing a spatially delocalised heralded single photon state into the memories. Then, the entanglement is revealed by mapping it back to optical modes and by performing quantum state tomography on the retrieved state. Our results show that two macroscopic crystals can be entangled together in an heralded fashion. 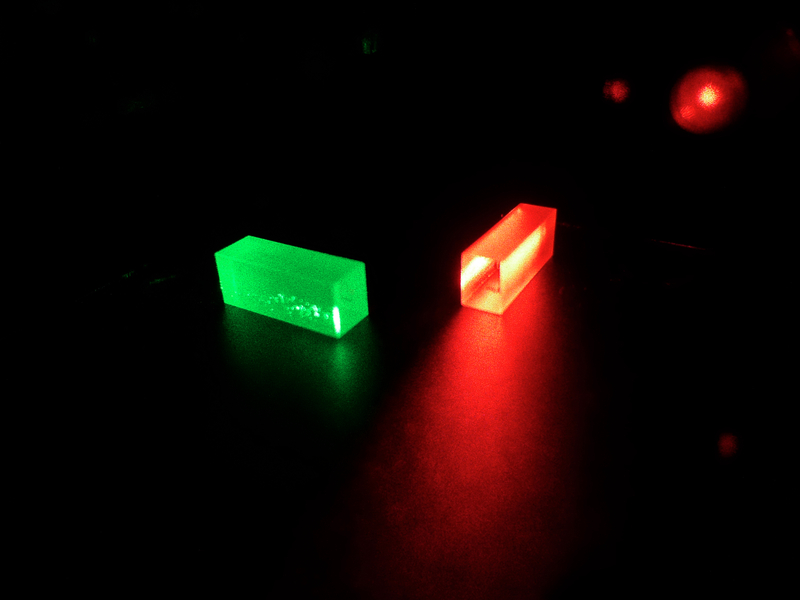 This brings quantum networks based on solid-state devices one step closer. For more technical information you can find the paper in Nature Photonics. In a recently published article, researchers from the QuReP partners, University of Geneva and IDQ, along with CERN and the University of Applied Sciences in Geneva report the results of the SwissQuantum Network. The network used quantum key distribution for secure communication between the University of Geneva, CERN and the University of Applied Sciences in Geneva. The network has been running reliably for more than 18 month in real-world conditions, which proves that the technology can live up to commercial requirements. The article, published in the New Journal of Physics, has been highlighted as an IOP select publication - despite only being published in September it has been downloaded over 250 times (only 10% of articles achieve this within a given year normally). Winter School on QKD - Scholarships available! QuReP Partner ID Quantiquewill be organising the fourth Winter School on Practical Quantum Cryptography in January 2012 in the Swiss Alps. The goal of this program is to introduce, to a general audience of physicists and computer scientists with little or no background in practical quantum cryptography, this exciting topic in a relaxed and stimulating atmosphere. The program also includes hands-on tutorials, as well key note lectures by renowned researchers Nicolas Gisin (University of Geneva), Renato Renner (ETH Zurich) and Vadim Makarov (Norwegian University of Science and Technology). Eligibility: Enrolled as a PhD student in a European research institution. Note: QuReP will provide two scholarships that will cover 1000 Euros towards the cost of attending the school. This scholarship does not cover traveling costs to and from the Winter School location. These costs must be covered by the participants or their institutions. The Winter School location can be reached by train (round trip ticket train cost: approx. EUR 75) from Geneva International Airport, which has low cost airline connections to many European cities. 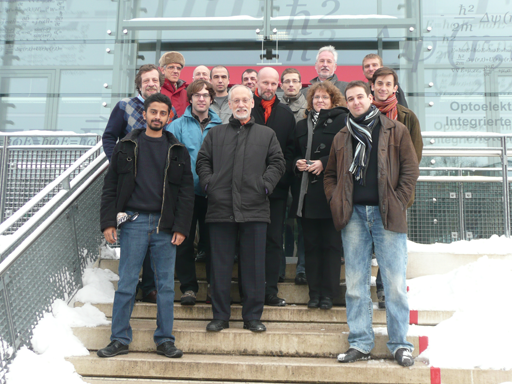 The 6th edition of the Quantum Information Processing with Rare-Earth doped Solids meeting took place in Barcelona on May 12-13, 2011. This meeting has historically been central to the QuReP partners with the current QuReP project having been born out of these meetings. With many of the QuReP partners in attendance, the goal of the workshop was to bring together the main European groups working in the field (as well as some overseas guests), in order to discuss on going work, new ideas, experimental challenges and potential solutions. 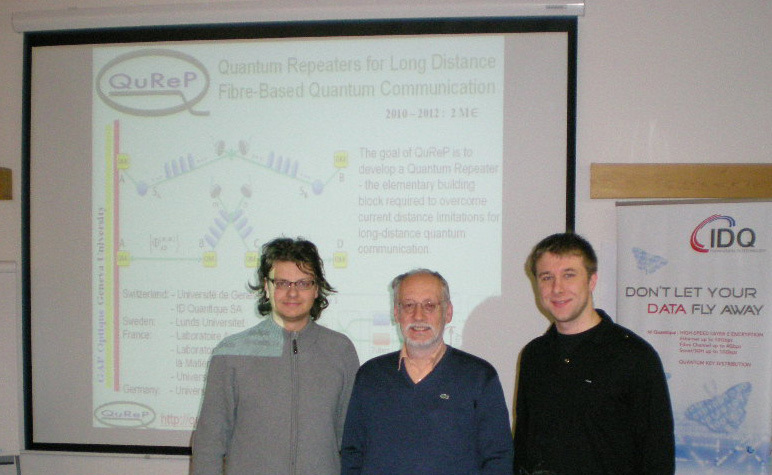 This year's edition was organised by ICFO (in particular the Group of Prof. Hugues de Riedmatten) and supported by ICFO as well as the European project QuReP: Quantum Repeaters for Long-Distance Fiber-Based Quantum Communication. The recent Winter School on Practical Quantum Cryptography was a huge success with a great mix of academics and industry people. An encouraging number of people (> 40%) were coming from outside the quantum communication community. Professor Nicolas Gisin (Center) with Scholarship winners: Alessio Avella - Università degli Studi di Torino (left) and Sergii Strelchuk - University of Cambridge (right).